We've enlisted blogger and new weaver Stefaniegrr of Handmade by Stefanie to work on a special project to display in our booth at the Intermountain Weavers Conference in Durango, CO this July 27-30, 2017. Today, she gives an overview on weaving for beginners and some of her tips for successfully completing this project. 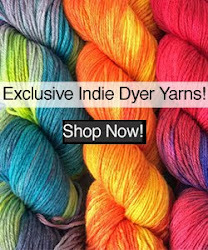 Handweaving is having a moment, and it seems like many of my fellow yarn lovers are dipping their toes into this craft. 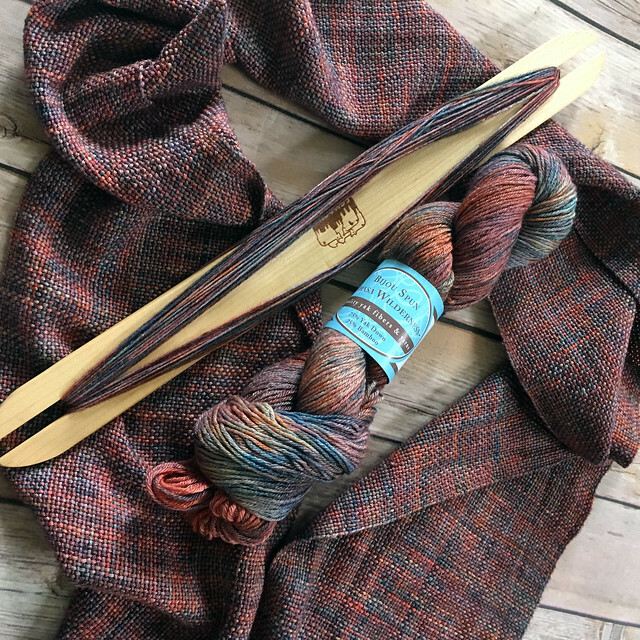 Instagram is filled with beautiful handwoven projects, and there are also some great new books and magazines full of interesting projects to make, even on little looms. 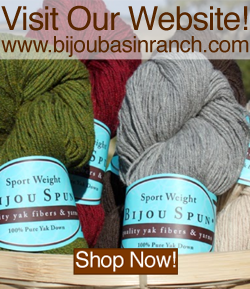 Weaving is fast and fun, but best of all, it eats up stash so you can make room for more yarn! Most of us probably think of those large, complicated-looking floor looms when the word "weaving" comes up. I admit, that's what first sprang to mind for me, too. However, there are many types of looms available for today's weaver: pin looms, rigid heddle looms, floor looms, jack looms, lap looms & tapestry looms, just to name a few. A pin loom or a rigid heddle loom are fairly affordable and easy to use, so they are great "starter" options for new weavers. After using a pin loom here and there, I finally took the plunge and ordered a rigid heddle loom at the start of the year - learning how to weave was one of my New Year's resolutions for 2017, so I am very new to the craft. While I can't profess to be an expert just yet, I have picked up some tips worth sharing with my fellow newbie weavers. 1. Weave a sample! Similar to swatching when knitting or crocheting, this is an important step to ensure that your finished project is the correct dimensions. If you are working with a new yarn, this is a great way to get to know it in the context of a weaving project - in this case, the slippery nature of Lhasa Wilderness (a yak and bamboo blend) required a small adjustment when weaving, since it doesn't have as much "grab" as a wool yarn does. Sample weaving also allowed me to practice making neat selvedges (edges), which can be challenging for new weavers (and even experienced ones!). When you look at my sample swatch, you can see the point where I finally got the hang of working with the Lhasa Wilderness yarn - suddenly, the selvedges look much nicer! Start by deciding what you want your finished length and width to be. Once you set these targets, the rest is easy! 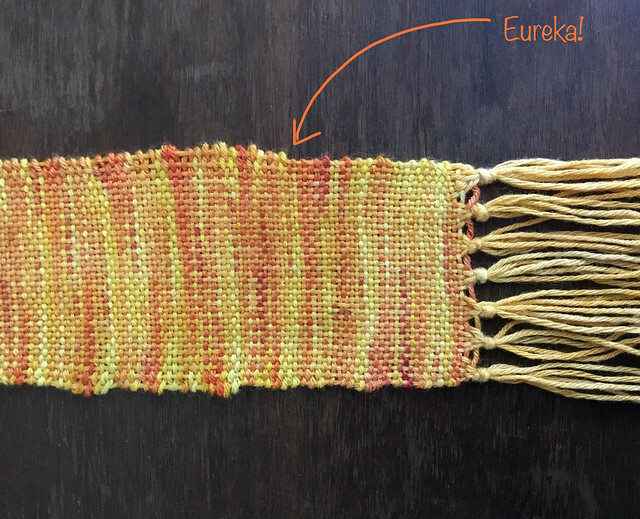 First, to determine the total width of your project on the loom - the finished piece will draw in (also known as shrinkage) once you begin weaving, so the width of your warp will be wider than your finished project width. You can either consult your swatch to figure out the percent of shrinkage, or use the standard 10% if you are ok with an element of surprise in your finished piece. The above number is for just one length of warp from end to end, so you'll need to do one last bit of math to figure out your total warp length. Grab a tape measure and count how many slots and holes are in 9" to determine your number of warp ends. In this case, that number was 90 (45 slots and 45 holes);. You'll multiply the number of warp ends (90) by the length of your warp (2.58 yards) to get your total warp length. Your weft will require approximately 2/3 as much as your warp, but I like to make sure I have a little extra yardage just in case. Either way, two skeins of Lhasa Wilderness yarn (shown here in Joseph) is more than enough to weave this scarf. 3. Finishing Hacks That Save Time. I think for a lot of crafters, the finishing steps can be real bugaboos - ask any knitter and most will agree that they dislike weaving in the ends on a multicolor project! 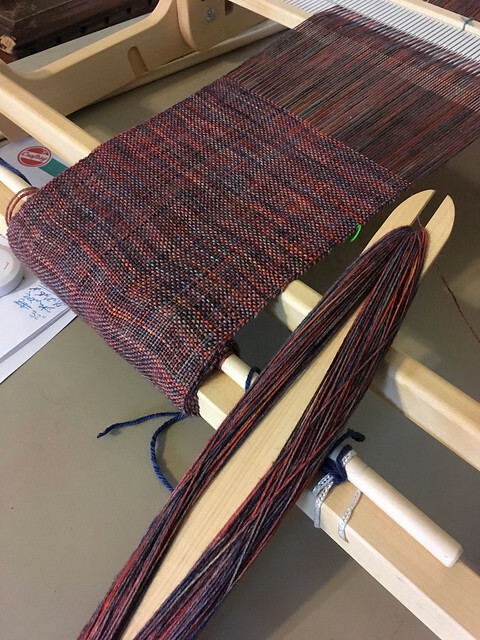 The complexity of your project will play a role in how much finishing you'll need to do, but there are a few basic steps that most weaving projects require such as securing the warp ends, weaving in weft ends and, of course, blocking! Removing the header is a lot of like carefully frogging a knitted or crocheted project - you just go slowly and unravel row by row to avoid unfortunate mishaps. I made sure to do this on a flat surface so I could also use gentle pressure from my left hand to secure the woven fabric while unraveling the last few rows of the header. Once the header is removed, it's time to tie your fringe. Here's where keeping notes comes in handy - if you know that you have 90 warp ends, you can easily determine how many ends to tie together to make equal fringe knots (in this case, you could use 5 ends per knot for a total of 18 knots). I recently invested in a rotary cutter for trimming my fringe, and wow - is it efficient! You'll need a metal edge to guide your rotary blade, along with a cutting mat (in a pinch, I have used a cutting board from my kitchen and it's worked beautifully). Simply measure how long you want your fringe to be, place your metal edge parallel to the edge of your weaving, and roll your rotary cutter along to make perfect fringe! Finally, you can use a blunt-tip tapestry needle to weave in any ends of yarn (unless you've "hidden" them as you went along); I prefer to wash my finished piece before I trim the yarn ends down so that they can settle into the fabric and are less likely to pop back out. Hand washing in Allure Fiber Wash is a great way to care for your woven scarf, since it doesn't require rinsing, plus is smells great! Keep these tips handy by sharing on Pinterest - pin the graphic below!